Class for out of the box parser hook functionality integrated with the validation provided by Validator. ParserHook::FH_NO_HASH makes the function callable without leading hash. Returns the list of default parameters. These parameters can be used as unnamed parameters where it is not necessary to use the name and the '=' as long as there is no '=' within the value. It is possible to define that a parameter should not have a named fallback. Therefore the information has to be returnd as sub-array with the parameter name as first and Validator::PARAM_UNNAMED as second value. Parameter using this option must be set first, before any unnamed parameter in the same order as set here. All parameters defined before the last parameter making use of Validator::PARAM_UNNAMED will automatically be populated with this option. Override in deriving classes to add default parameters. Returns a description for the parser hook, or false when there is none. Override in deriving classes to add a message. 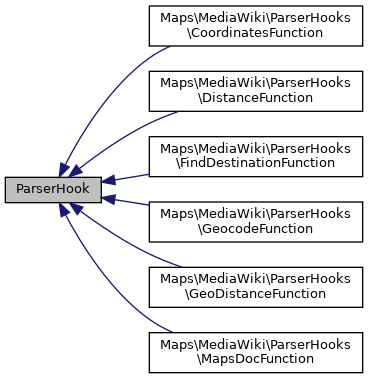 Returns the data needed to describe the parser hook. This is mainly needed because some of the individual get methods that return the needed data are protected, and cannot be made public without breaking b/c in a rather bad way. Returns the ProcessingError objects for the errors and warnings that should be displayed. Returns the parser function otpions. Returns the name of the ParserHook deriving class that defines a certain parser hook, or false if there is none. Returns a description message for the parser hook, or false when there is none. Override in deriving classes to add a message. Gets the name of the parser hook. Returns an array with the names for the parser hook. Returns an array containing the parameter info. Override in deriving classes to add parameter info. Returns an array of registered parser hooks (keys) and their handling ParserHook deriving class names (values). Function to hook up the coordinate rendering functions to the parser. Returns if the current render request is coming from a parser function. Returns if the current render request is coming from a tag extension. Function to add the magic word in pre MW 1.16. Utility function to parse wikitext without having to care about handling a tag extension or parser function. Renders and returns the output. Creates and returns the output when a fatal error prevent regular rendering. : FIXME: Is this really necessary? The same thing is propably going to happen in Parser::braceSubstitution() if 'isHTML' is set! : other options besides 'isHTML' like 'noparse' are ignored here! Handler for rendering the function hook registered by Parser::setFunctionHook() together with object style arguments (SFH_OBJECT_ARGS flag). Takes care of validation and rendering, and returns the output.